China has said reports it is holding a million Muslim Uighurs in detention in Xinjiang are "completely untrue". Uighurs enjoyed full rights but "those deceived by religious extremism... shall be assisted by resettlement and re-education", officials said. The rare admission from Beijing - at a UN meeting in Geneva - came in response to concerns that the region "resembles a massive internment camp". Xinjiang has seen intermittent violence - followed by crackdowns - for years. 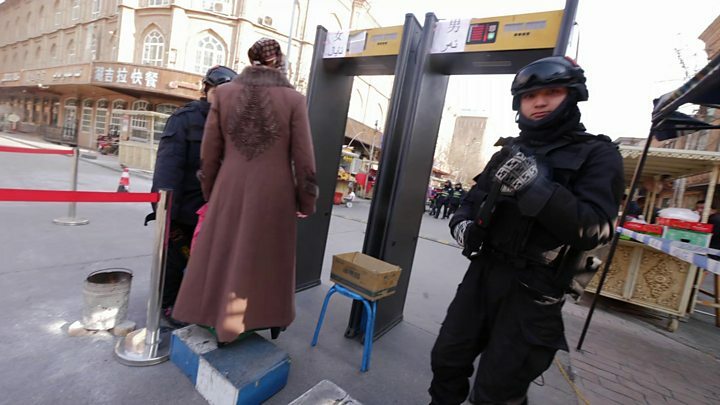 On Friday, committee member Gay McDougall said she was concerned by reports that Beijing had "turned the Uighur autonomous region into something that resembles a massive internment camp". In his response, Hu Lianhe, deputy director of China's United Front Work Department of the Communist Party Central Committee, said: "Xinjiang citizens, including the Uighurs, enjoy equal freedom and rights." "The argument that one million Uighurs are detained in re-education centres is completely untrue," he added, before admitting the existence of resettlement or re-education programmes. "The turnaround in Xinjiang's security situation has avoided a great tragedy and saved countless lives," it said in an editorial. The Uighurs are a Muslim ethnic minority mostly based in China's Xinjiang province. They make up around 45% of the population there.